Packaging Dimensions 3.3 in. x 1 in. x 1 in. 1 answers Which coil is similar to "Miller 5481-k"? 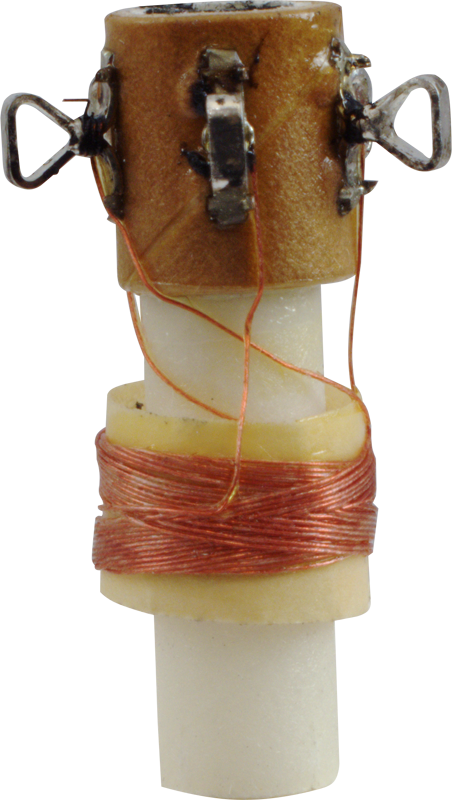 This is the only oscillator coil we carry. It is based on the Miller 70-OSC. 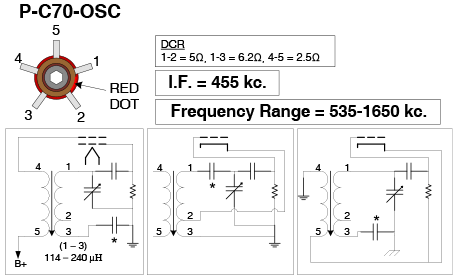 1 answers Can the 70-osc coil replace a 71-osc coil? Please refer to the spec sheet pictured in this listing to determine compatibility with your existing coil. To be honest we wouldn't really have the spec information for coils in house. Tubes we can tackle but in terms of coils the only one we carry is the 70 OSC. 1 answers I'm in need of a 5 lug coil, the IF=456 on mine this is for a D-726 Truetone. The old coil has no ID number. This is a 5 lug coil with a I.F. of 455 kc. It will work in an application that calls for these specifications. Thank you for your inquiry. We are not techs here at Antique Electronic Supply and with that in mind; we can not offer you technical advice. I would post your question on one of the antique radio forums. Someone there should be able to help you figure this out. 1 answers What is the allen key size is required to adjust this coil? You will need tool # 9440 from our Alignment Kit. Do a search for SKU: S-T18-530. 1 answers Do you have a coil to produce 50 to 60 kHz with an el 84 valve? This, along with the P-C70-RF and the P-C70-A, are the only coils we carry at this time. 1 answers I need an oscillator coil for a low shortwave band from 2 to 7 MHz. Is it possible to modify the P-C70 by replacing the slug with one that's the same width but shorter? Would such a slug supply the required inductance and capacitance? We are not able to comment on the effects of modifying this item. You will need to consult a tech to verify this will work the way you need it to.